It’s been over 6 months since deployment began. Time passed, holidays and seasons came and went and we all grew and changed in that time. It hasn’t been an easy 6 months. We lost 3 people, had a helicopter crash and one of our own squadron’s jets is sitting at the bottom of the ocean. The crew ejected and are safe but these things remind us of the danger that is a part of the everyday in this world. 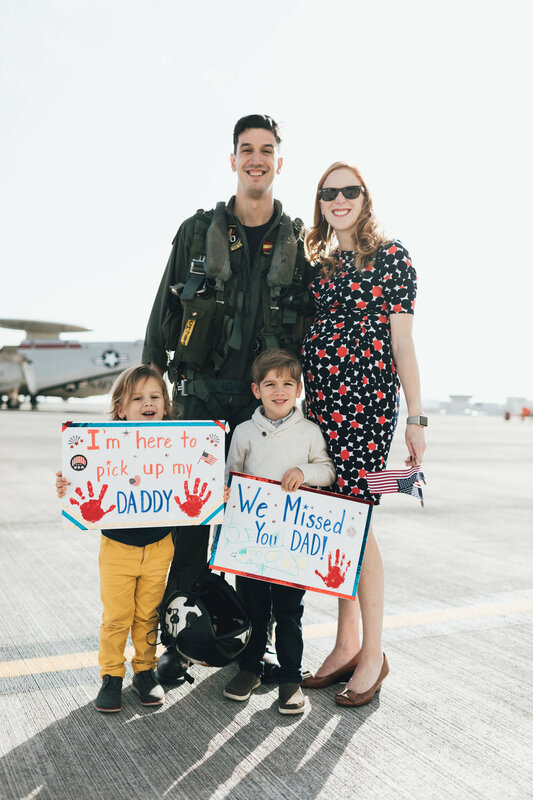 When our pilots and crew return, it is more than just joy at their return, it is relief. There is so much meaning in this day and this reunion that most people will never experience or understand. It’s more than just being reunited with the one you love. It means that they are safe and get to live with you at home again. It means that you made it through one of the hardest things you hopefully ever have to do. It means that you are strong and you can do hard things. And it means that finally you can breathe and relax and get back to normalcy. It is relief and peace and gratefulness and pride and joy and light and love all wrapped up into one day and one incredible moment. On this day, life becomes normal once again. These boys get to talk to and play with and be held by their dad again. This incredible woman gets to know that her husband is safe and that he will come home at the end of the day again. She can relax knowing that the hard part is over and she can breathe again.